Do you want all eyes on you? Rich fabrics, ornate beadwork and embellishments make this look not only glamorous but also "over the top" indulgent! Do you love the classics? 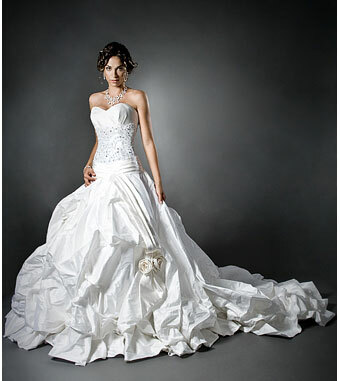 Dramatic ball gowns or slimmer A-line silhouettes with movement, add elegance and sophistication to any bride's look. Are you less glitz more substance? A style with simple lines, little or no embellishments and form fitting silhouettes will emphasize your "no frills" attitude right from the get go. Do you love the modern urban vibe? Gowns with "hard" lines, architectural draping and pleating are synonymous with today's ultra modern sculptured approach to bridal fashion. Although you may have already determined your personal style, it is best to experiment with many gowns before narrowing your choice down to just a few. Even some ultra chic brides often end up with soft romantic gowns on their wedding day. Keep your options open and use the basics as a guide but ultimately, let your body and your instinct determine what looks best on you!